in·spire ( n-sp r ) v. in·spired, in·spir·ing, in·spires v.tr. November is a particularly busy month for me…and it’s almost over!!! Can you believe December is right around the corner. Who would guess, especially with all the warm-ish weather around here lately? It certainly makes attending to all those last-minute, before the snow, outdoor chores a little easier to accomplish. I did break-out my pair of Carhartt overalls a week or so ago… silly me! Most of my gardening chores have been completed (with the help of my goats!). I’ve potted my rosemary plants and made a few topiary forms to offer for sale in my shop. I’ll also over-winter several rosemary pots indoors… rosemary won’t survive MI winters un-protected! My scented geraniums, bay tree and French lavender potted plants have all been re-located indoors for winter as well. Yesterday, I finally removed all my FALL corn stalks & pumpkin decorations. Even though I semi-decorated a wee bit for the Christmas holidays a few weeks ago (to set the mood for my Holiday Open House), I couldn’t bring myself to taking down the pumpkins ’til after Thanksgiving! I divided my pumpkins between the goats, sheep and chickens…a little treat they all enjoy (don’t forget to split them open)! We have taken two of my goatie-girls ((Coriander, whom I’m still milking as a first freshener and Cassiopeia, who’s my yearling doe and will be a first freshener next Spring)) to rendezvous with Buck-y Boy (hubby will not ‘allow’ me to keep a buck of my own) for a romantic date! Hopefully they’ve ‘settled’ . I’ve marked the calendar and I’ll be watching for signs of returning heat. We took advantage of Matt home for the weekend and also shuffled around sheepies in preparation for breeding… just a few ewes. I always look forward to Spring-time and the farm babies – happy happy times! Besides all the usual day-to-day rig-a-ma-roll, I’ve been trying to keep up with fiber’n projects to re-fill the shop. I don’t mass-produce anything… and the effort to keep a decent inventory can be overwhelming at times! I try not to succumb to the anxiety of it all and continue to do what I enjoy ~ one day at a time ~ but, there’s soooo much more I’d like to do, there doesn’t seem to be enough time for it all. Here’s a peek at a few simple things I’ve been working on…to inspire you. Perhaps you can gather ’round with family and friends and test your own hand-work. After all, it’s the memories and friendships that are the most important gifts! 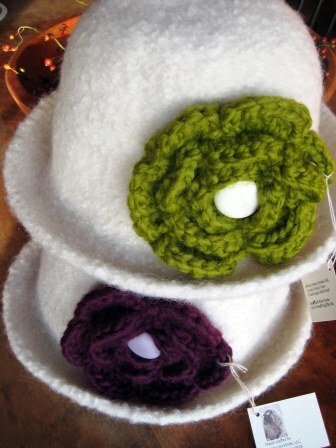 I’ve used my crocheted flowers to embellish knitted/felted hats (a Fiber Trends pattern). You could also add a feather, costume jewelry, vintage buttons, etc. 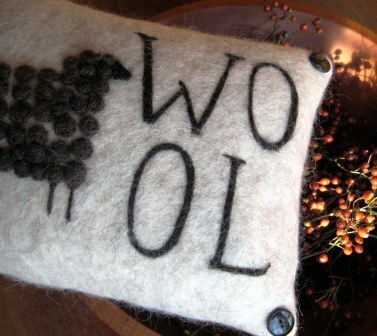 Another wet-felted sheepy pillow. Got WOOL?? 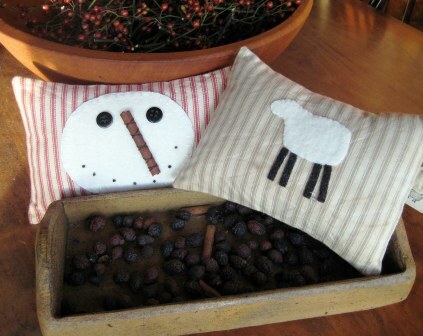 …and a simple prim scented pillow/sachet stuffed with scented rose hips made with ‘tea-stained’ striped ticking fabric. Less is more, eh? Snowmen have the benefit of decorating all winter, and sheep… well, forever! 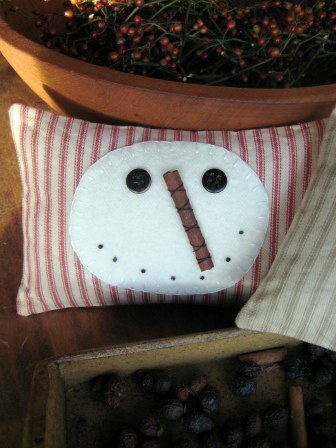 I cut an oval from wool and blanket-stitched it to the ticking; used old buttons for eyes, embroidery floss French knots for ‘mouth’ and a cinnamon stick (in keeping with the scented rose hips) for a nose, stitched-on with a few prim stitches. But, you could use a twig, needle felt or recycle wool/felt for an orange carrot nose too! 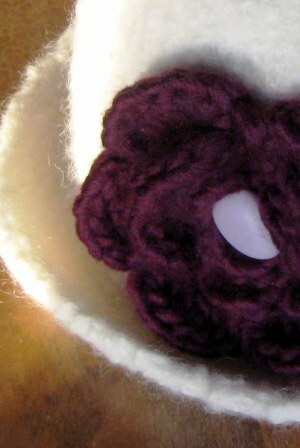 I wanted a very simple, plain sheep…she’s made/stitched on with recycled wool and stuffed with scented rose hips too. 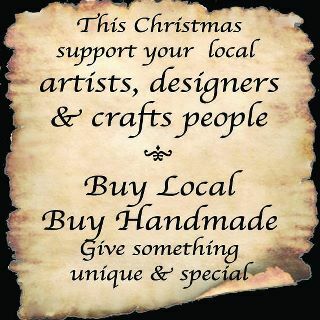 In parting, just a reminder of the many local artisans that will be hosting a ‘free’ Holiday Open House December 3 & 4. Shop home-made. Explore a few (if not all) the local shops & drop-in and say ‘hello’! We truly appreciate your business! 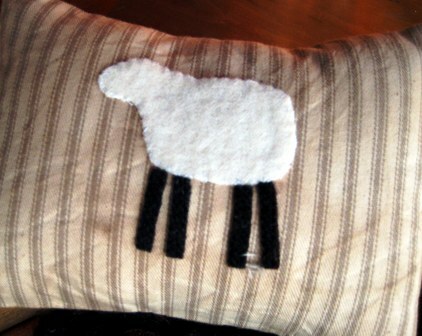 This entry was posted in Farm, Projects and tagged hand-crafted, hand-made, simple gifts by Sheepy Hollow Farm. Bookmark the permalink. Dear Jenny: I just love your site. I am on your e-mail list to receive your blog and really enjoy everything you do. I have returned to school as a mature student (in my 50’s) to take a Textiles & Design program at our local college here in St. John’s, Newfoundland, Canada. I spent years doing office administration, and after my second daughter graduated high school, felt it was time I did something I longed to do for years. I’m loving the program and my absolute favourite thing is felting. I purchase the fleece and dye it, then create things. I do mainly school projects, but we had to create a product for our local Christmas craft fair, and of course mine was wet and needle felted. You are an inspiration to people like myself. I don’t know if I will ever own livestock, but my husband and I are heading into retirement. I hope to start up some cottage industry myself, and one of my assignments is to create a business plan. It is a great idea and prepares someone like me for the financial side. I have never done anything like this before, and though exciting, I realize it will be a lot of hard work, but that is what life is all about. I finish up the program in June and we will be moving to either Nova Scotia or New Brunswick as my husband has taken on a new position. Any words of wisdom you can impart I would be more than happy to receive. Again, thanks so much for your blog. I’d love to get to your neck of the woods one day. Bravo Carol! I applaud you for pursuing your dream! ‘Age’ is just a number (lol), so don’t let that be a deterrent to following your heart. I would enjoy a Textiles & Design program very much, as I have no formal training in the fiber arts… perhaps you INSPIRE me!! I left my engineering position after 23 years to raise my children, but also to nurture my creative-soul. I love commuting with my barnyard menagerie on a daily basis; their wool/milk is a bonus! However, you don’t need to raise livestock to create your fiber stash. There are many LOCAL fiber farms who would be more than happy to sell their raw wool to you…seek them out! Attend fiber shows to explore the diversity of fiber; visit a fiber processing mill. Join a spinning/fiber guild. There are many passionate fiber folks out there who love to share. I think a business plan is a great idea. It should be flexible to allow change as you grow. Do not be opposed to changes or tweeks to your Plan. Change is not a failure. Be true/follow your heart. Accept the fact that you can’t please everyone. A supportive partner/husband is also very important! Lastly, MARKETING is probably your biggest and most important challenge. You must do it well to get the exposure (and sales) you’ll need to succeed as a business! (I don’t do enough myself…). Submit articles/items to trade magazines – get published (something I have yet to pursue), create a blog/website, connect with like-minded people, etc. Hi Jenny! I wear hats!!!! Love them. Yours are lovely. Miss you much we’ll chat soon. Hope all is well. All is well in Teemie-land (()) I know you are wondering 🙂 Thank you for being the sweet loving person you are. Hi Teemie! I had a visitor in the shop Sat who said they had visited you earlier! So, I knew you were ok. Miss you!